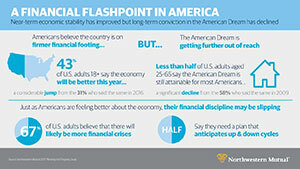 The 2017 Planning and Progress Study seeks to provide unique insights into U.S. adults’ attitudes and behaviors towards money, financial decision making, and the broader landscape issues impacting people’s long-term financial security. The study is based on an online survey of 2,749 U.S. adults conducted from February 14-22, 2017 (2,117 interviews with U.S. adults age 18+ in the General Population and an oversample of 632 interviews with U.S. Millennials age 18-34). Data were weighted to be representative of the U.S. population (age 18+) based on Census targets for education, age/gender, race/ethnicity, region and household income. 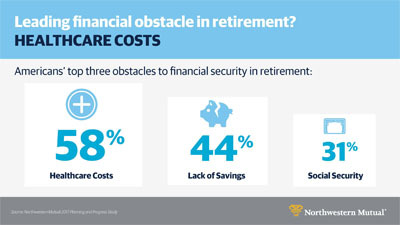 Americans view healthcare costs as the leading obstacle to financial security in retirement, according to new data from Northwestern Mutual’s 2017 Planning & Progress Study. In fact, the number of Americans citing healthcare costs as their chief concern spiked dramatically from 45% in 2016 to 58% this year. Lack of savings (44%) and Social Security uncertainty (31%) followed healthcare costs to round out the top three. The research released today is part of Northwestern Mutual’s 2017 Planning & Progress Study – an annual research project exploring Americans' attitudes and behaviors toward finances and planning. 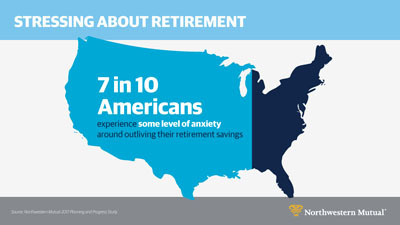 Despite growing anxiety about retirement costs, the future availability of Social Security, and insufficient retirement savings, this year, fewer Americans said there is some chance of outliving their savings --- down to 62% from 69% in 2016. 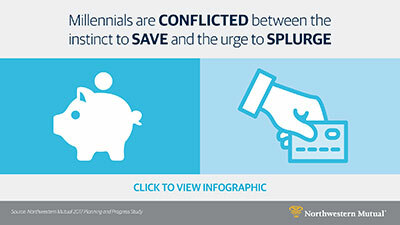 Northwestern Mutual’s 2017 Planning & Progress Study reveal that Millennials are caught in a tug-of-war between their long-term financial aspirations and the lure of spending now. Balancing these competing priorities are resulting in heightened levels of anxiety that are impacting Millennials’ physical, professional, and social well-being. The pressure of trying to meet competing financial and lifestyle priorities appears to be making Millennials significantly more professionally and financially anxious than other age groups. More than half (53%) of Millennials experience high to moderate anxiety about losing their job, compared to less than a third of Gen Pop (29%). The same is true for level of savings (67% Millennials vs 50% Gen Pop) and income (69% Millennials vs 48% Gen Pop). 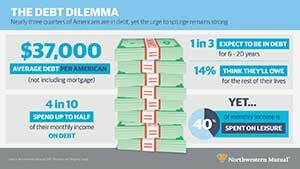 Seven in 10 (70%) American adults aged 18+ consider themselves part of the middle class, according to new findings from Northwestern Mutual’s 2017 Planning & Progress Study. This compares interestingly to analysis of government data by the Pew Research Center showing that the number of middle-income households in the United States has been dropping for four decades, and made up only 50% of the U.S. adult population in 2015, down from 61% in 1971. 84% of American adults say that one defining element of the middle class is based on income or assets. More than half of those who identified as middle class in the study have household incomes ranging from $50,000 to $125,000 annually. Single Americans are less likely to consider themselves middle class -- 57% of single men and 59% of single women say they’re middle class vs 85% of non-single men and 74% of non-single women. Additionally, the overall percentage of single Americans in the middle class dropped fairly significantly in the last five years -- 67% of single men and 62% of single women said they were middle class five years ago compared to 57% and 59% respectively who say the same today. Overall numbers are flat -- 70% of Americans consider themselves middle class today, and a nearly identical number (71%) thought they were middle class five years ago. Financial Advice – the key to confidence and the antidote to anxiety? 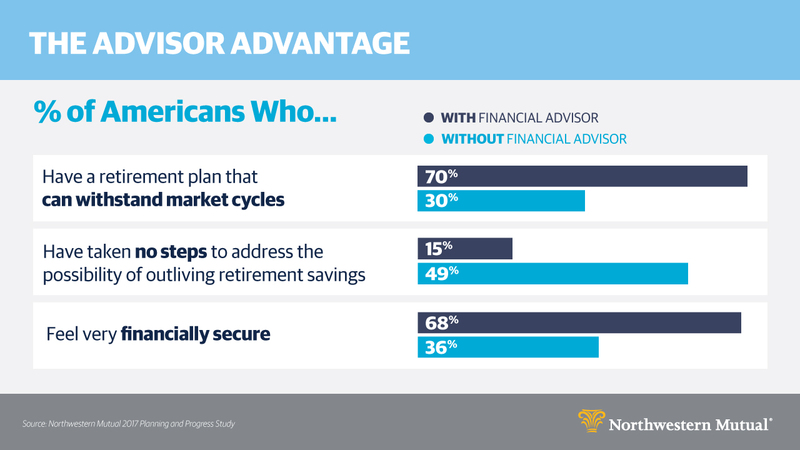 In addition to a heightened level of retirement readiness, Americans who use advisors tend to feel more financially confident overall. 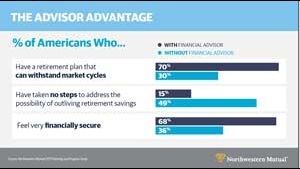 Notably, individuals with financial advisors are almost twice as likely as those without advisors to say they feel “very financially secure” (68% vs 36%). Additionally, more than three quarters (77%) view themselves as “highly disciplined” or “disciplined” planners compared to 41% of those without an advisor. Good financial habits may be a key reason why people with advisors experience significantly less anxiety about debt, income, poor credit, and unplanned health or financial emergencies. And the data suggests that Americans are increasingly embracing the value of professional financial advice. This year there was incremental growth in the number of Americans with an advisor (35% up from 31% in 2016). The uptick was particularly pronounced within the Millennial generation, with 29% currently using a financial advisor versus 21% in 2016. Despite recognizing the downsides of debt, the lure of spending remains strong. After covering off on necessities, Americans said 40% of their monthly income goes toward discretionary spending on entertainment, leisure travel, hobbies, etc. In fact, when asked what financial pitfalls they are prone to, one quarter of Americans flagged “excessive/frivolous” spending. Nearly three quarters (72%) of Americans feel financially secure. These positive signals, however, were tempered by a more sober long-term outlook. 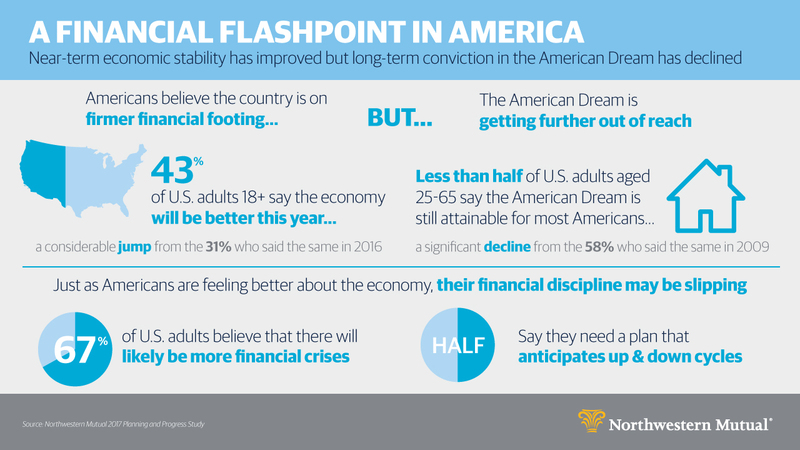 Today, less than half (48%) of U.S. adults aged 25-65 say the American Dream is still attainable for most Americans, compared with 58% who said the same in 2009 – the first year of the study. The majority (67%) of U.S. adults 18 and over believe that, over time, there will likely be more financial crises. While the number is high, it’s a sharp decline from the three-quarters (76%) who said the same in 2016. 43% of U.S. adults say the economy will be better this year than in 2016, versus 31% who said the same last year. 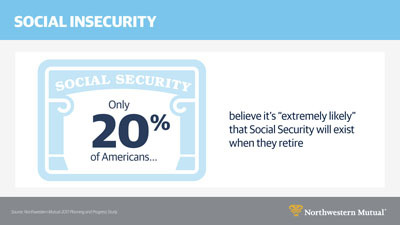 72% feel financially secure. And more than a third (38%) expect their financial security to increase in the next year, which is double the number (19%) who expect to feel less secure. Only 50% of U.S. adults 18 and over say they need a plan that anticipates up and down cycles. 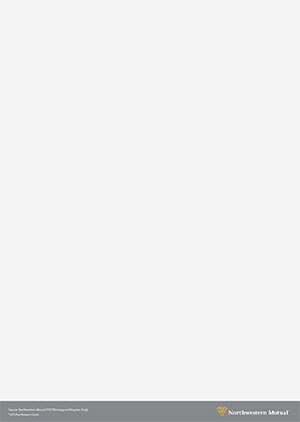 This is a drop from the 57% who said the same last year. Only 41% say their long-term savings strategy has a mix of high and low-risk investments, compared to 44% last year.